Bas relief sculpture of Roman slaves. Christianity forever changed western civilization. 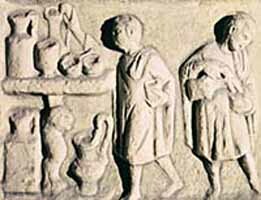 While the Greeks and the Romans contributed much to philosophy, governmental structure, architecture, community planning, military strategy, art, and various other secular pursuits, they didn’t contribute to the ethics or heart of the western world. The ancients enjoyed blood sport. Over half of the population were slaves. They led aggressive wars. They were polytheists and emperor worship was demanded–upon pain of death–and there was no religious freedom. They practiced infanticide, exposing unwanted babies, especially girls, to the beasts and the elements. They were brutal and used force to control their subjects. Flogging, crucifixion, burning, impaling, and torture were commonplace. The ancient world may have had a form of order, but they were not civilized. Piercing through the darkness of this time was the Light of the World, a simple carpenter from the middle east, Jesus of Nazareth. He would become the most powerful civilizing influence humanity has ever known. Plato also thought that the need for slavery was a natural condition of humanity (perhaps a necessary evil), but Jesus said that he came to set the captives free! He stands alone in ancient history as the friend of the slave. In a world that had no energy supply, slaves were a form of power. Those who owned them had a source of production, a way to earn money or obtain goods. There were those who did manual labor and those who didn’t. Work was scorned. It was looked down upon as the destiny of those in the lower class. But when Jesus came, he changed this attitude. How? By being a common laborer — a carpenter. If the King of Glory can work with his hands, how can I despise hard work? His disciples were also common laborers. Peter was a fisherman. Paul was a tentmaker. There were no upper class disciples. They were all laborers (or in Matthew’s case, a tax collector) who would have been despised in the ancient world. The letters of Paul also reflect this changing attitude towards labor. In his second letter to the Thessalonians, he tells the church not to feed those who won’t work even though they are able. (The Didache even says that the church should consider a traveling prophet to be false if he wouldn’t work.) The example of Jesus made honest employment admirable, not despicable. The effect this had on the labor force was tremendous. It lessened the need for slaves because more people were now willing to work in allegiance and service to their King. Paul also pointed out that on a spiritual level all were equal before God. This was different from the Roman religion, which wouldn’t even allow slaves to venerate their gods because they would have defiled their worship. But Christianity had such a leveling effect on society that slaves had to be encouraged to not look down on their masters. (1 Timothy 6:2) Slaves would become full members of the church. They would be treated as equals. After Peter and Paul, the next bishop of Rome was Linus, a slave. Callistus, another early bishop of Rome, was also a slave. The church, unlike the Roman empire, would recognize slave marriages, and while pagans were always sure to distinguish the tombs of the slave from the tombs of the free man, Christianity would make no such distinction. While the church only consisted of a small band of poor, weak Jews in a huge, powerful, and somewhat monstrous empire, there was certainly no hope that they could overthrow the slave system through force or revolution. Certainly, rebellion had been tried before, and the third time it was led by Spartacus, whose forces included trained gladiators, and yet they failed. Their bodies, crucified by the thousands, would line the Appian Way for miles. Paul had no hope of overthrowing a system or empire that was capable of striking such a crushing blow. Christianity was a leveler. It made all people equal before God. Age, gender, nationality, and income weren’t important in the kingdom of God. The only thing that mattered was the heart. A Christian was one who had humbly received the grace of God through Jesus and then lived a life of purity and love towards others. It didn’t matter where a person was in life. Young, old, rich, poor, black, white, educated, uneducated, male, female, Jew, Greek, slave, free. Every life was special, created by God, and worthy of love and respect. The church would continue in this passionate thrust toward releasing captives and setting them free until slavery no longer existed as an institution. Melania would be one of many wealthy converts, who would sell their possessions and give them to the poor. She would also be one of many who released their slaves. In her case, she is reported to have set eight thousand slaves at liberty. During the Barbarian invasions of the 5th to 7th centuries, captives from conquered cities were hauled away into slavery and the church intervened, redeeming them by the thousands. Aristotle, “Politics,” The Basic Works of Aristotle. ed. Richard McKeon (New York, Random House, 1941, 1131-1132. “The Didache,” Early Christian Fathers, Volume 1, trans. and ed. Cyril C. Richardson (Philadelphia: The Westminster Press, 1953), 176. H.G. Wells, The Outline of History: Being a Plain History of Life and Mankind, Volume I. (Garden, NY: Garden City Books, 1949), 498. Robert Ellsburg, All Saints: Daily Reflections on Saints, Prophets, and Witnesses for Our Time (New York: The Crossroad Publishing Co., 2005), 105. Clement, “Letter to the Romans,” Early Christian Fathers, Volume I, trans. Cyril C. Richardson (Philadelphia: The Westminster Press, 1952), 68. William Barclay, The Letter to the Hebrews (Westminster: John Knox Press, 2002), 226. “The Shepherd of Hermas,” Apostolic Fathers, trans. J.B. Lightfoot and ed. J.R. Harner (Grand Rapids, MI: Baker House Books, 1967. ), Wesley Center Online, http://wesley.nnu.edu/biblical-studies/noncanon/fathers/ante-nic/hermas1.htm (accessed 2/23/2008).